The other night while making eggrolls, we had several pasta sheets left over after the eggroll filling was all gone. Rather than stick them back in the fridge, I decided on the spur of the moment to imitate an appetizer we had had at (where else) Panda Express once—cream cheese won-tons. 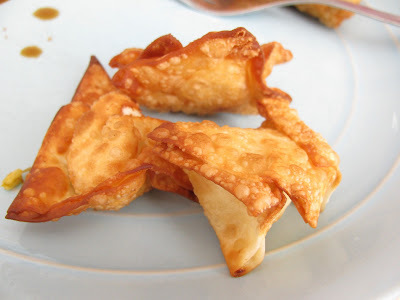 They were very easy, and the cream cheese went surprisingly well with the fried wrapper. We dipped them in soy sauce and the zing of the sauce was a great complement to the mildness of the cream cheese. Scoop a small dollop of cream cheese into the center of each won-ton square. Wet fingertip with water and dab on opposite corners of square. Bring opposite corners together and push to seal. Do the same thing with remaining corners. (Essentially, you're trying to draw all four corners into the center and seal the sides. You'll end up with a neat-looking little package.) Alternatively, if you're using won-ton wrappers, you can wrap them according to the directions on the package. Fry in oil over medium heat, or when oil pops when water is dropped in, but isn't smoking much. Drain on paper towels. Serve with your choice of dipping sauce. I LOVE THOSE! Don't they sometimes have crab in them?